These suspension brackets are made from 7075-T6 aluminum alloy. We have also added new RC shims to adjust the roll center at 1 and 2 mm off the chassis plate. This again further allows you to fine tune your kick angle, anti-squat and Roll center height. As mentioned above there are some new adjustments, but some old ones as well. The 7075-T6 brackets also allow you to fully adjust the front kick-up 0,0.5,1,1.5 and 2 degree increments. As mentioned above there are some new adjustments, but some old ones as well. The 7075-T6 brackets also allow you to fully adjust the front kick-up 0,0.5,1,1.5 and 2 degree increments. The rear anti-squat is no different as you can adjust that from 1,1.5,2,2.5,3 degrees, and the Toe-in adjustment can be made, 2,2.5,2.75,3,3.25,3.5 and 4 degrees using the inserts provided in the kit. The customers talked…we listened, this new SRX8-GT is outfitted with a super easy access center 2 speed assembly. Not only is it easy to access, with simply removing 2 screws you can have the entire 2 speed out of the car and ready for adjustment/maintenance faster than you can make it to the concession stand for a beverage. If you have a good thing, let’s keep it going... That is exactly what we did with the ball bearing raced sway bars. We introduced this first the 1.8th offroad and then followed that up into GT. Both the front and rear suspension will get the same treatment. The sway bar will be securely fastened and the left and right play can be adjusted. Depending on your grip level and track surface, you can adjust the stiffness of the SRX8-GT’s arms. Generally stiffer arms have a more linear feel but can reduce grip. This happens by forcing the shock to do more work. The Front steering spindle, made from 7075-T6 is black anodized with silver machined edges. This part is a carryover part from the SRX8. It also includes a rubber CVD boot to keep the driveshaft greased, to minimize wear. The steering spindle also accepts 5 different Ackermann plates. 0,1,2,3,4. Generally 0 is the easiest steering while 4 is more aggressive. You can fine tune your GT’s steering to fit your driving needs. All plates can be easily identified by the notch marks in the side of the plate. Being involved with the Gt category from almost the beginning, Serpent has understood the direction and path necessary to produce a race winning car. With the S811-GT being our Designer Billy Easton’s first GT, mating his knowledge of design with team drivers Joaquin Desoto and his son, as well as countless other team members, was a match made in heaven. Working tirelessly on new concepts, suspension geometry, product assembly and durability, our team was able to create an absolute monster of a product. The SRX8-GT has innovations at virtually every corner, while being one of the easiest cars we have ever produced to work on. 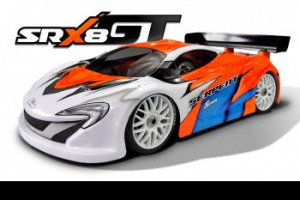 Here at Serpent we are extremely proud of the SRX8-GT and have taken great pride in the design, from top to bottom. We didn’t just want to make a new car, we wanted to make a new car that simply changed the game. If you’re looking for sheer performance and quality in one product, look no further the SRX8-GT is the one for you, this product is simply rivaled by no-one.